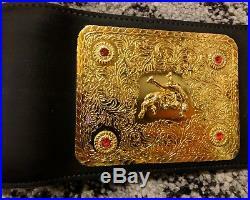 1999 WCW Big Gold World Heavyweight Championship Belt ADULT SIZE - Ric Flair. To be the Man, you gotta beat the Man! And now that he is retired you missed your shot! Get to stylin and profilin and Learn to Love it cuz its the best thing going! 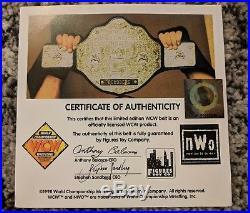 This belt is an officially licensed WCW product and was released by Figures Toy Company way back in 1999! The belt HAS NEVER BEEN DISPLAYED and is in great condition for being almost 20 years old! Details of the belt are as follows. Molded from the actual championship belt. The Main Plate is 13.4 inches x 11.7 inches and comes with a Ric Flair nameplate. Side plates are 5.2 inches x 4 inches. Plates are 2mm thick and material is Zinc Alloy. Medallions are ornamented by 22 simulated ruby studs (18 red and 4 white). 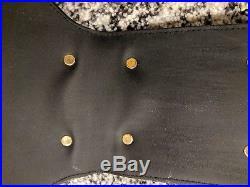 The belt strap is made of PVC plastic (but is flexible - see picture). Strap dimensions: 55.3 inches x 12.2 inches x 0.25 inches. Fits up to a 46 inch waist. Comes with a cloth carrying bag. Some background (from Wikipedia) on the Big Gold Belt - The WCW Championship belt was originally designed in 1985 by silversmith Charles Crumrine and commissioned by Jim Crockett Promotions for NWA World Heavyweight Champion Ric Flair. 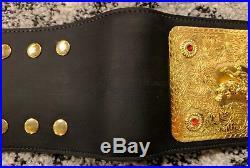 The championship belt has three large gold plates with a distinctive name plate onto which the champions name was etched. While not the first wrestling championship belt to incorporate a name plate, it popularized the concept. The championship belt debuted on February 14, 1986. 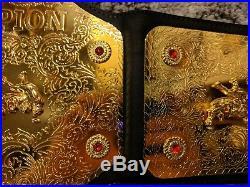 As you can see in the picture, this championship belt comes with the nameplate of Ric Flair. You can also see that this is pre WWE days as there is no branding of the company logo on the front of the belt. 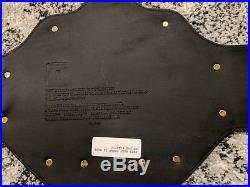 (WCW is listed on the back of the belt, along with the date, etched into the strap which you can also see in the pictures). While this belt is in great condition, there are some slight creases on the belt straps from being in a folded position and being never displayed since it arrived on my doorstep from QVC in 1999! 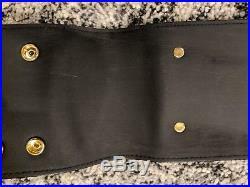 This Ric Flair Championship belt has been safely stored in the cloth carrying bag that came with the belt. (Please note that there are some slight stains on the white cloth but it does not affect the belt). From the pictures you can see the gold plates are still vibrant. This Championship belt also comes with a Certificate of Authenticity (although Goldbergs belt is displayed in the pic since he was the champ at the time). Make your friends jealous as you become a Jet flying, Limousine riding, Kiss stealing World Champion! Please take a moment to look at my other auctions and see if I have what you cant live without! The item "Ric Flair WCW NWA WWE Big GOLD Belt Heavyweight Championship Title Adult Belt" is in sale since Sunday, August 12, 2018. This item is in the category "Sports Mem, Cards & Fan Shop\Fan Apparel & Souvenirs\Wrestling". The seller is "sidewinder33" and is located in Madison, Wisconsin. This item can be shipped to United States.